Welcome to our church! We are a Christian church that worships the triune God: Father, Son, and Holy Spirit. At our church, we hope that you will find a place to nurture a relationship with God and with neighbours. We record all of our sermons, and we also record special music during offerings; click here to download .mp3 or .wma files. We are close to both the University of Waterloo and Wilfrid Laurier University! If you're looking for a church community while you're away from home, if you're looking for Sunday worship, if you're looking for Christian university friends, if you're looking for God, or if you just want a free lunch (the first Sunday of each month after the morning service!)... we warmly invite you to check us out! Children aged 3 through Grade 3 gather at the midway point of each service for singing and time with their classes. From October through May, students from Grade 4 through Grade 8 meet for class prior to the service, from 9:30 to 10:15. Classes meet in designated rooms in the church. Look for the sign on the door for the grade you need. We are located at 209 Bearinger Road (on the south-west corner of Parkside & Bearinger) in Waterloo, Ontario. The church is adjacent to the north edge of the University of Waterloo campus, and close by to Wilfrid Laurier University. Please consider joining us on Sunday! We would love to get to know you and experience the wonder of God together. The spring clothing sale will be held on April 21 from 9:00-11:00 am. This semi-annual event provides the opportunity for us to exchange and purchase quality used clothing for a minimal amount. Fill a large bag for $3, a small bag for $1, or bring in a bag of clothing to exchange for free. As you put away your winter clothes and begin to sort your summer clothing, please consider donating to the sale. We also accept gently used children's toys, books and household items. You may bring any donations the morning of the sale, or drop them off in exchange for a ticket prior to the sale: Thursday April 19 from 7:30 pm - 8:30 pm or Friday April 20 9:30 am - 11:30 pm. Volunteers are needed to deliver flyers the week before the sale, sort clothing the morning of Friday April 20 (9:30 am - 11:30 am), and to sort and clean up on Saturday. If you are able to help, or if you have any questions, contact Evelyn Zwart (evelynzwart@aol.com, 747-4452). Register here for our Vacation Bible School program this summer for kids entering JK through Grade 6, running from July 9 to July 13. 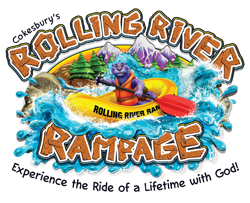 Join us each morning at Rolling River Rampage as we Experience the Ride of a Lifetime with God. Through stories, crafts, games, science and music each day, we will explore how to serve God and what God's mission is for our lives. Parents, grandparents, younger siblings and caregivers are welcome to join us around 11:15 each morning for our closing exercises. Then, all are welcome on Thursday, July 12, at 7:00 pm for our annual ice cream social and presentation and again on Sunday, July 15, at 10:00 where the children will participate in the service. Questions about our VBS program? Email vbs@waterloocrc.org or call 519-746-5727. The fall clothing sale will be held on Saturday, October 27 from 9:00-11:00 am. This semi-annual event provides the opportunity for us to exchange and purchase quality used clothing for a minimal amount. Fill a large bag for $3, a small bag for $1, or bring in a bag of clothing to exchange for free. Please consider donating to the sale. We also accept gently used children's toys, books and household items. You may bring any donations the morning of the sale, or drop them off in exchange for a ticket prior to the sale: Thursday Oct 25 from 7:30 pm - 8:30 pm or Friday Oct 26 9:30 am - 11:30 pm. Are you a mom in need of encouragement? Do you enjoy sharing and socializing with other moms? Have you gained knowledge in motherhood that you would be willing to share? Consider joining us at Waterloo Christian Reformed Church for our Mom-to-Mom program. Mom-to-Mom provides practical, godly advice that will help nurture your relationship with God, your spouse and your children. Together with other women, you will attend weekly sessions that uplift and encourage you as you experience the challenges and joys of motherhood. This is an opportunity for women of any age and childcare is provided for children 0-6 at no cost. The program has ended for the summer, and will resume again in September on Thursday mornings from 9:30 - 11 am at the church. Call our church (519)746-5727 or email coffeebreak@waterloocrc.org for more information. Check out our church calendar to stay informed about important dates and events.